Among the many species, varieties and cultivars of the genus hydrangaceae this dwarf (30" in 10 years in this garden) ought to be planted more often. 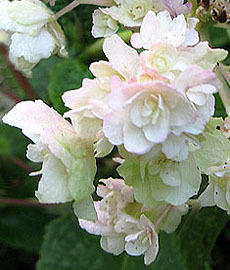 It flowers late summer into autumn with double, soft white florets which in the open turn rose-pink. 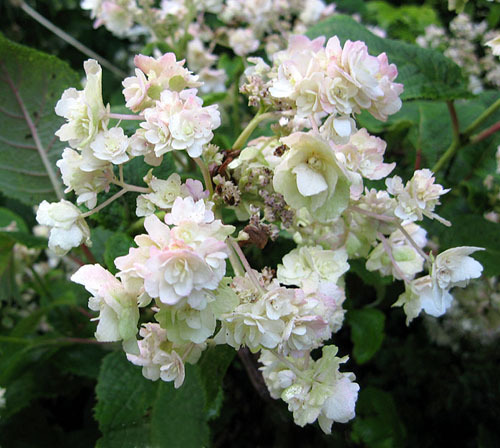 Like all other hydrangea it likes a moist soil, with a generous helping of compost and fertiliser in early spring. It requires little if any pruning and delights most visitors. Companion planting of the new pink Heuchera is being considered.